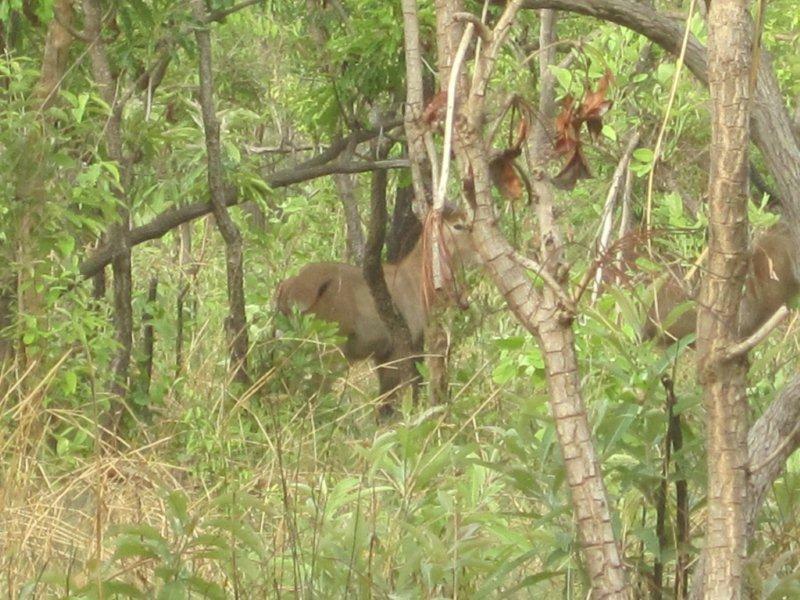 The highlights of this fortnight were visiting the schools that are going to participate in the Global School Partnerships programme and going to Mole National Park. The GSP schools are a representative group from across the Talensi-Nabdam district. Eighteen schools are looking to partner schools in Milton Keynes and four will be partnering schools in Haverhill, Suffolk. The schools in Haverhill have already been identified and include Walton High’s Leading Edge partner school Castle Manor Business and Enterprise College. I will be working with colleagues on my return to identify another eight schools in Milton Keynes. 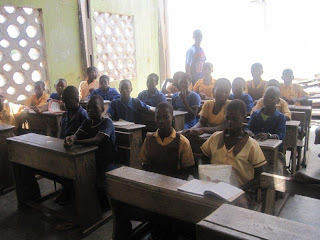 Both primary and Junior High Schools are involved in the programme. If successful, the initiative will provide excellent learning opportunities for the children and in staff in both countries. Below are some of the children and schools in Talensi-Nabdam that will be taking part in the programme. 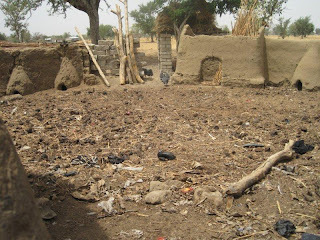 These schools are just off the Tamale Road to the south of Bolgatanga. Just over a thousand children attend the two schools that share the same site. 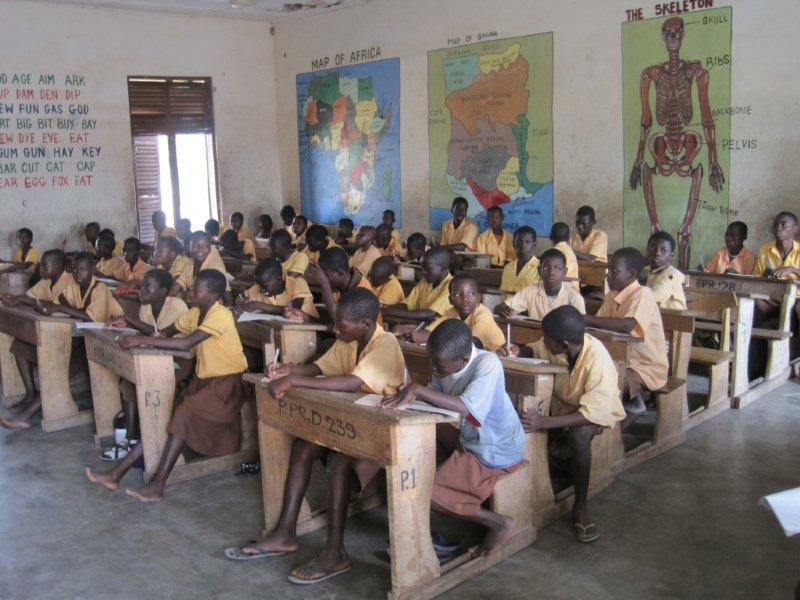 Students in both the Junior High School and Primary School sit in rows at dual desks. This, and large class sizes, encourages teaching to be very didactic and students’ are usually very passive in their learning. The students in all the schools visited were exceptionally well behaved and incredibly patient. It is not unusual for students to sit in their classrooms waiting for their teacher to turn up. I came across one class without a teacher and asked where their teacher was - they pointed outside at a teacher asleep under a tree! Teacher absenteeism is a major problem, but due to the centralised system headteachers are powerless to do anything about it. It appears that regardless of how unprofessional or incompetent a teacher is, they cannot be dismissed. The worst that can happen is a transfer to another school. 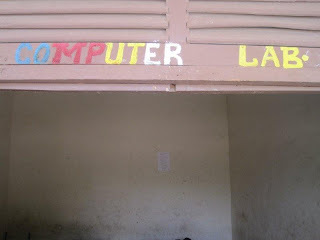 The headteacher of Takano JHS had a good sense of humour and insisted upon showing me his school’s computer lab. As you can see from the photos below, the name above the door is as far as it goes! 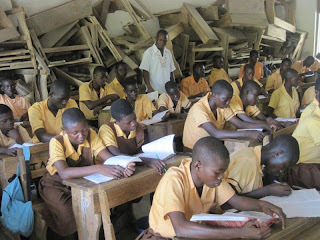 A problem across the district is the recent delivery of new desks – you can see them piled up at the back of this classroom. 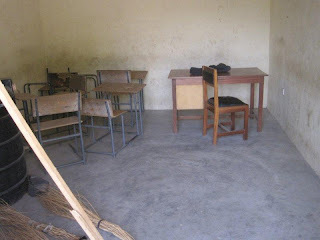 Unfortunately the contractor the government commissioned to provide the desks used green wood and as it dried the furniture fell apart. Schools can’t get rid of the broken furniture until the District Auditor has visited to write the desks off! 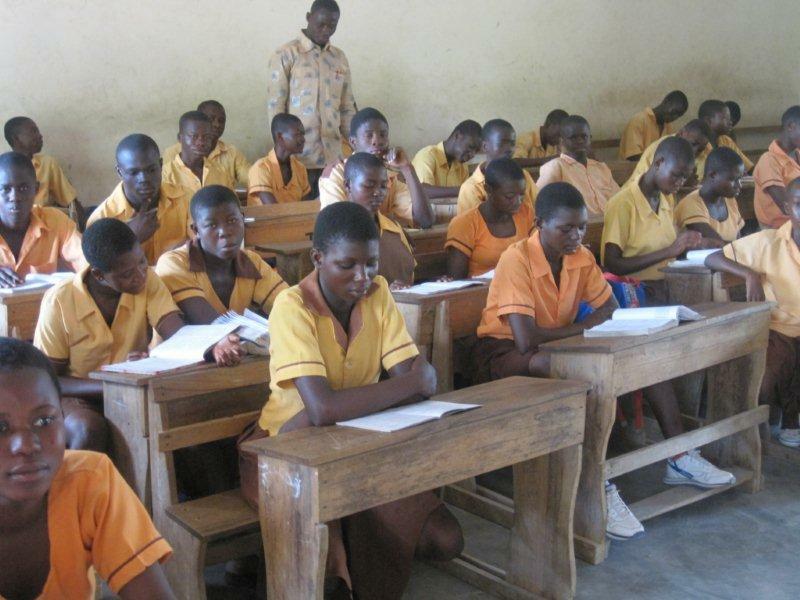 The building stock in the District is inadequate to meet the growing demand for education. As mentioned earlier in my blog, as a result many children are taught outside under trees. A number of schools in the GSP programme have problems with their buildings. Pwalugu Primary School has to teach a number of its classes in buildings that are called pavilions. This is especially unfortunate because the Headteacher has made a real effort to ensure that the proper classrooms provide a good learning environment for the children as seen by the displays on the wall below. 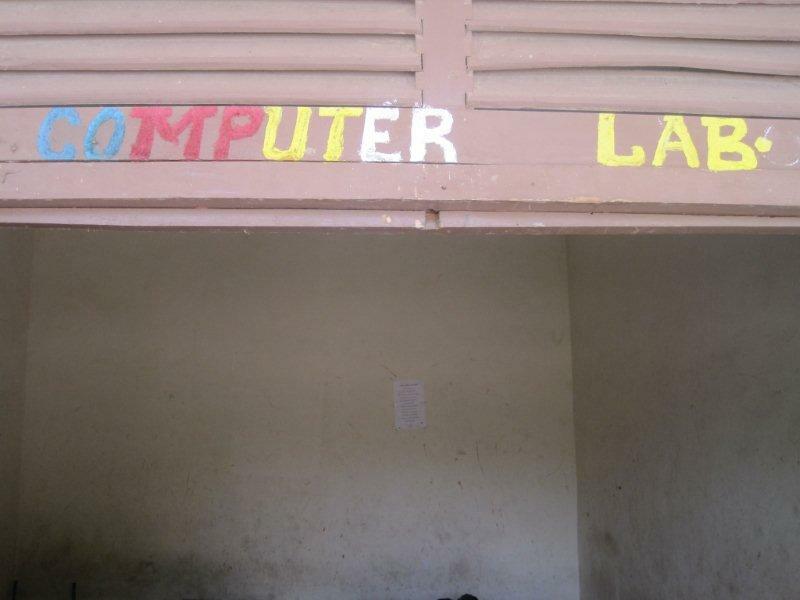 Displays on the walls of classrooms are very unusual in Ghanaian schools, but they can make an enormous difference to the room. 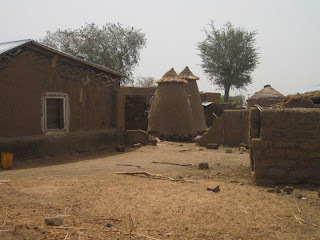 Tengzuk is a village not far from the GES office in the Tongo Hills. 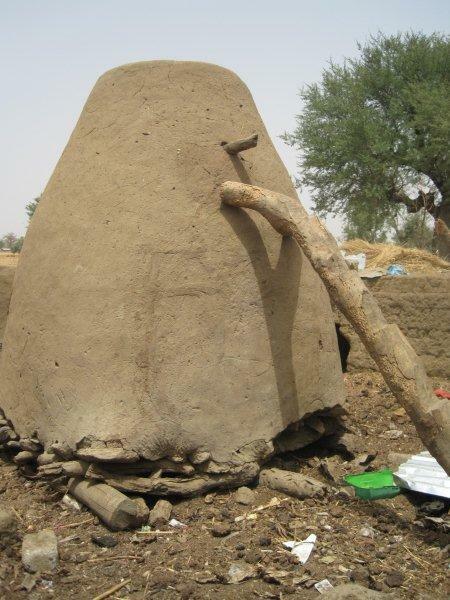 It is famous for its shrine and the whistling noise in the made by the wind in the surrounding hills. 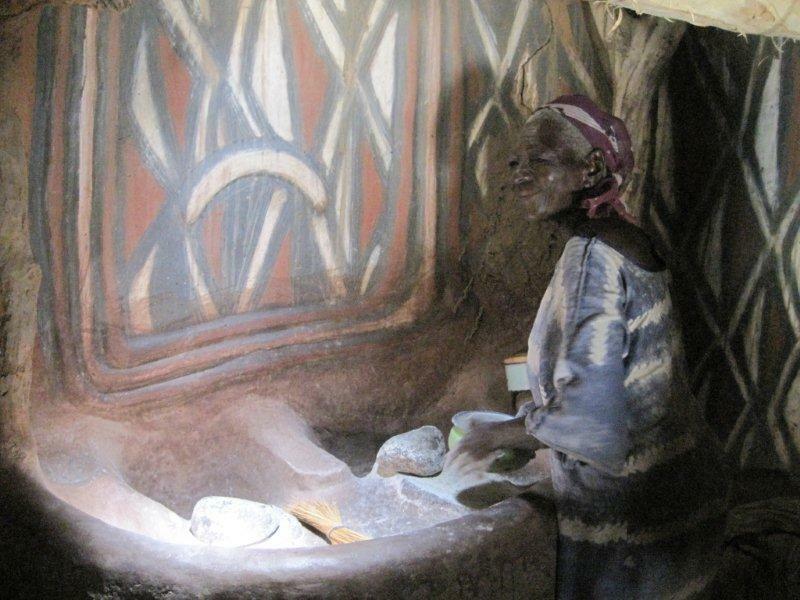 All visitors must remove all the clothes on the upper part of their body and leave them as an offering to the ancestors. Needless to say, I was not going to visit any shrine that required me to go bare all! Tengzuk Primary School has some major issues with its buildings. 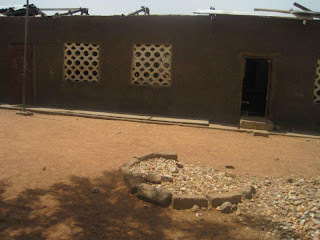 During the storms of 2007 the roof was ripped off and despite assurances from the District Assembly they are still waiting for it to be repaired. 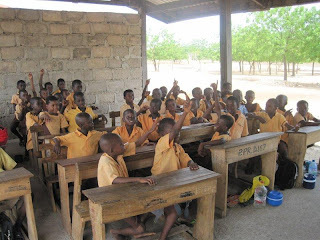 However, notwithstanding the lack of roof, lessons still go on in the classrooms. The success of the campaign that encouraged parents to send their children to school has been very successful across the District. However, this has put a lot of pressure on school accommodation and led to increased class sizes. This is especially the case in kindergarten and primary schools. 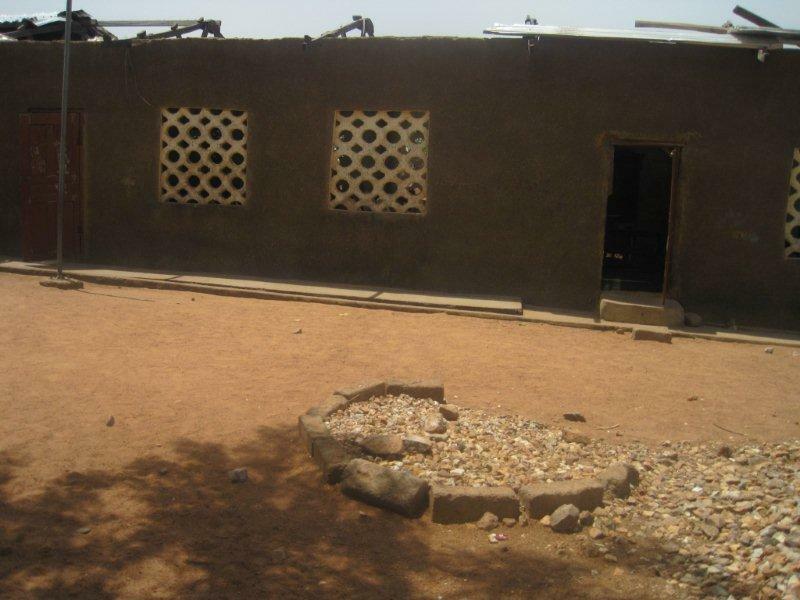 The problem with accommodation was only one of the challenges facing the Headteachers of the schools in the GSP programme. 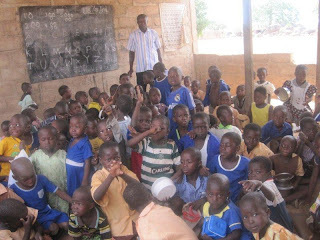 Other issues included the lack of trained teachers and insufficient teaching and learning materials. Hopefully, the partnership will be able to help with some of these issues. 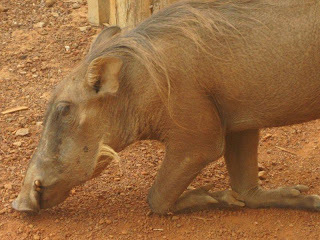 Over the weekend I met up with Janet and Karen, the other Headteachers who went to Ghana with me, for a very pleasant long weekend at Mole National Park. 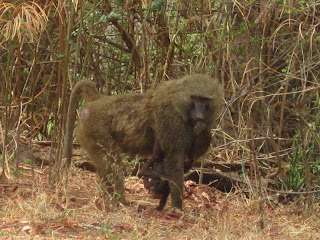 Mole is Ghana’s largest national park and is located in the Northern Region which s to the south of the Upper East Region. Due to the problems with the car hire company and the condition of the roads it took all day to travel to the Park. However, the journey was worth it for the opportunity to view the animals in their natural environment and for the air conditioning in my hotel room! 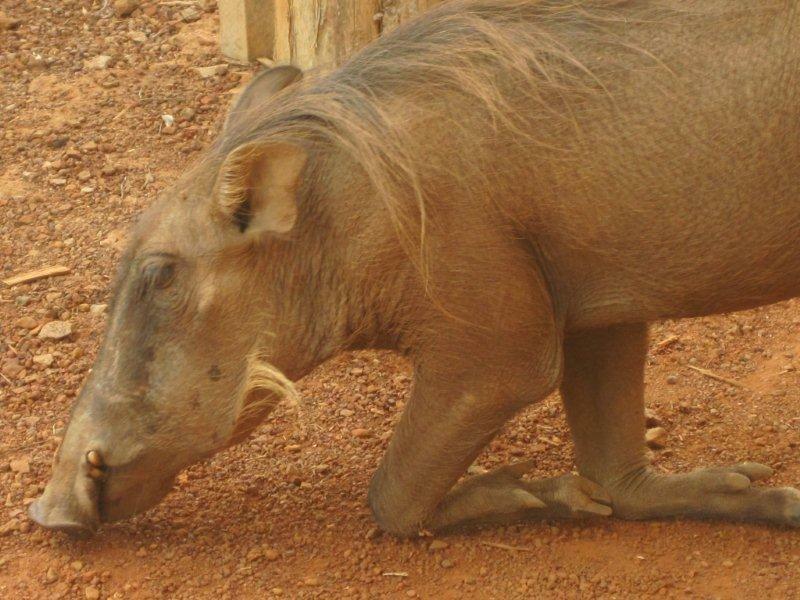 Some of the wildlife we encountered on our safaris is shown below. This week was spent planning for the Global School Partnerships (GSP) workshop held on Thursday. The British Council’s Global School Partnerships programme links schools in the UK with schools in other parts of the world. The aim is to promote the awareness of global issues across the curriculum. Partner schools work together on developing joint projects based on five conceptual areas: social justice and equality; diversity; globalisation and interdependence; sustainability; peace and conflict. The Talensi-Nabdam GES Director, Francis Ayaaba, and the Director of Children’s and Young People’s Services in Milton Keynes, Gail Tolley, have agreed to develop a Local Authority wide partnership. In addition to the four MK-TN GSP clusters, there will also be a link to Walton High’s Leading Edge Partner School in Haverhill, Suffolk, with four of the Ghanaian schools being partnered with schools there. Feedback on the workshop was very positive, with a lot of excitement about the possibilities the partnership offers for the children and staff in both countries. 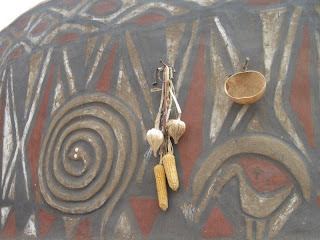 At the weekend I visited the Art and Pottery Centre at a village called Sirigu close to the Burkina Faso border. 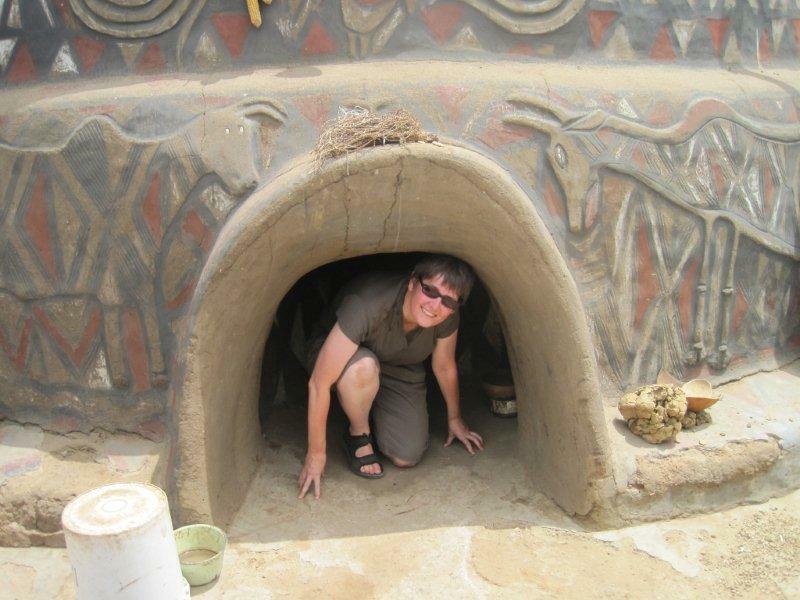 The centre was set up a few years ago to create opportunities for local women to sell their art and craft work. 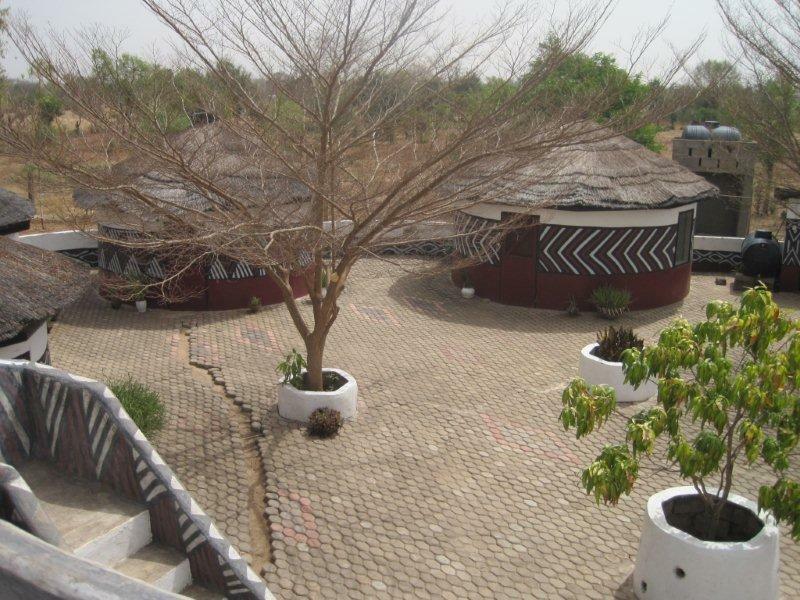 Since then it has diversified and also offers good quality guesthouse accommodation and tours of local compound houses. This area of Ghana is famous for its beautifully painted houses. On the walls inside the Art Centre’s restaurant are some examples of the different designs used by local people to decorate their homes. 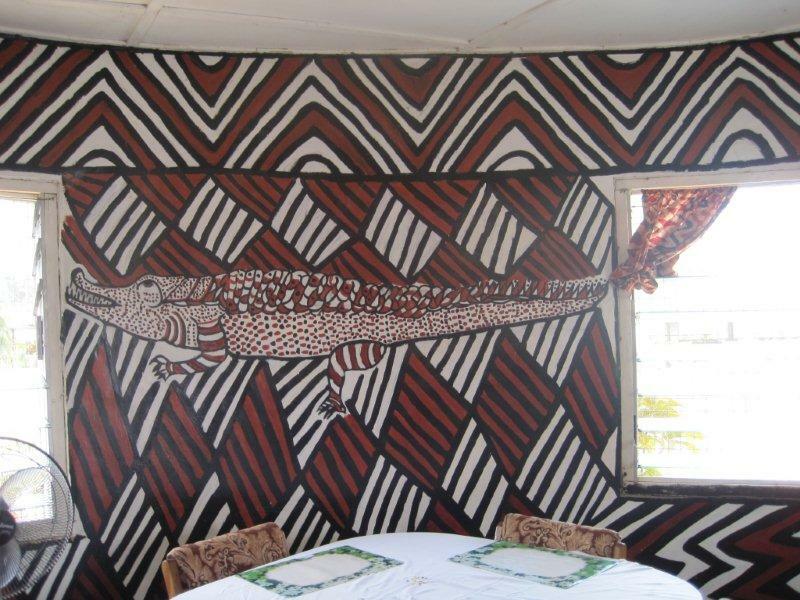 All the materials used to create the patterns and images are natural and found locally. 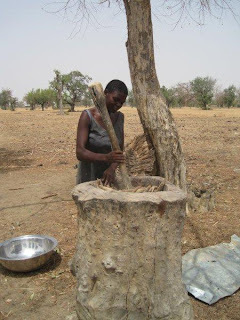 On the short walk to the compound home we were visiting, we came across women involved in activities that have not changed over the years. The girl below is pounding millet to separate out the seed from the husk. This is hard work in temperatures of well over 40 degrees. The millet us used to make T-Z, one of the staple local dishes. 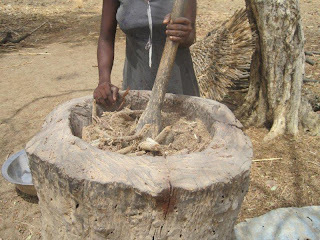 The woman below is stirring a large bowl of pounded ground nuts to extract the oil. 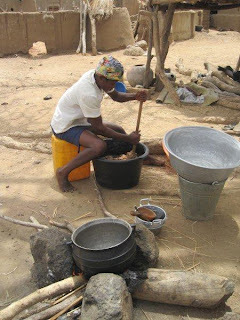 The ground nuts are grown on the farm to make ground nut oil and paste for the family. Any surplus will be sold at the local market. In the north of Ghana you will pass many traditionally built compound homes. 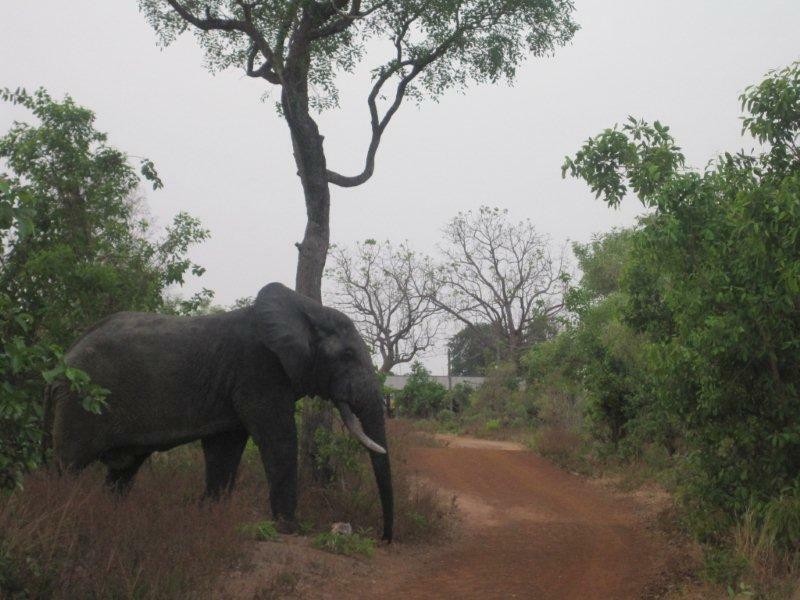 Visiting one of them gave a fascinating insight into many people’s lives in this part of Ghana. The different areas of the home are arranged around a courtyard. This is where the family cook and eat and where the laundry is done and hung out to dry. 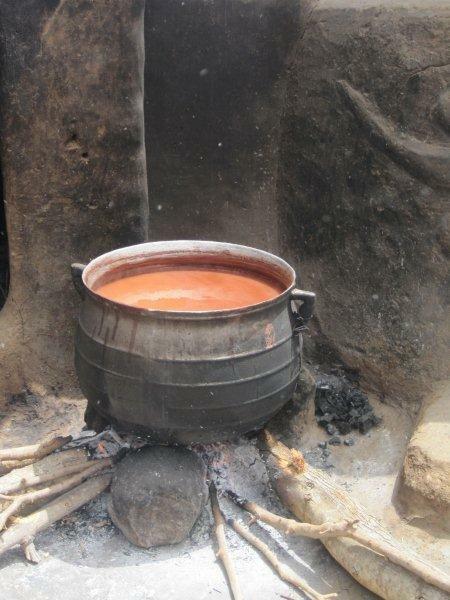 The large pot below is brewing the local alcoholic drink called Pito. There is also a manger area to keep the farm animals safe at night and a separate grain store which is accessed by a ladder made from the branch of a tree. We were invited into one of the rooms that surrounded the courtyard. It was beautifully decorated on the outside and was entered via a small opening. 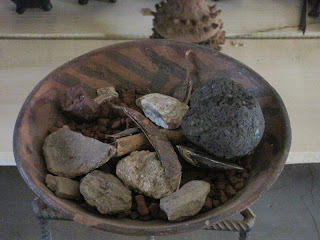 Our guide explained that in the past this was for defensive purposes as this area was regularly raided by slave traders. Any attackers entering the room would have to enter head first, making them very vulnerable to attack by the people taking refuge inside. In addition, entering a very dark room from the bright sunlight would also make them temporarily blinded as their eyes adjusted to the darkness. The entrance to this room is now larger than in the past, but you can still see how it would have been a useful defensive measure. Inside the room an old lady was busy grinding millet (and a few ants). Despite the temperature outside being well over 40 degrees the room was surprisingly cool. 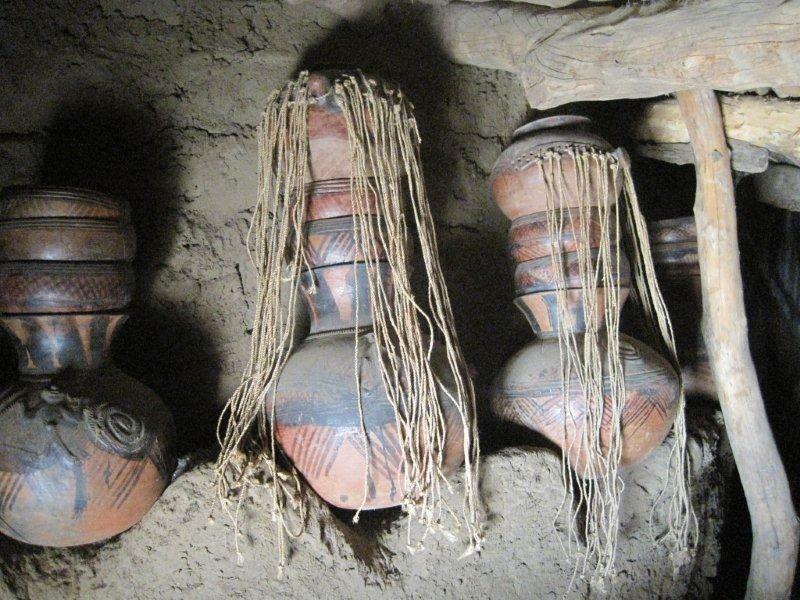 This room was also where the women of the family stored the special stacking pots that are given to them when they marry. Only the woman who owns the pot is allowed to look inside or remove any of its contents. Local people believe that something very unpleasant will happen to anyone who dares to look inside. 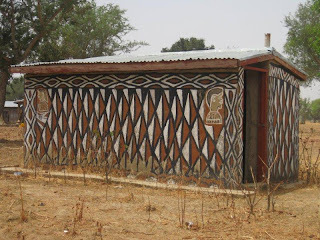 Just opposite the Sirigu Art Centre is the best decorated public toilet block I have ever encountered. 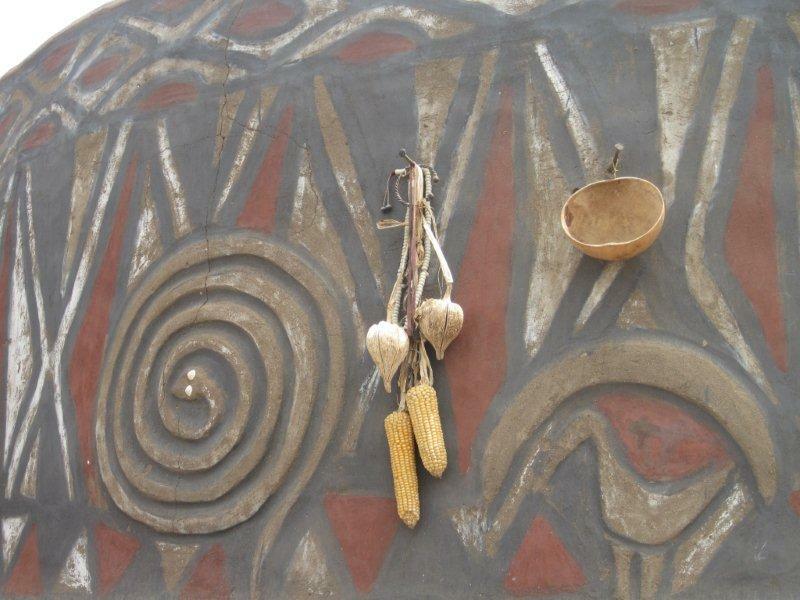 Unfortunately when we visited Sirigu Art Centre many people were not around as an important local supporter of the project had recently died and her funeral was that day. Attending funerals at the weekend appears to be almost a national pastime. I have heard more than one news report commenting on the negative impact funerals are having on the country (especially education) due to the number of working days that are lost. 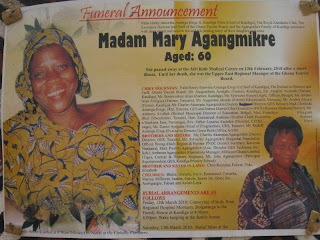 In this part if Ghana, and possibly elsewhere, burials and funerals are separate events with funerals taking place months or even years after a person has died and been buried. The delay allows the family to save for the funeral as they can be very expensive affairs that last several days. My taxi driver, Adams, is very critical of this practice and has often said that the same people who spend lavishly on funerals often say they cannot afford school uniforms or pens and pencils for their children to go to school.